While The Takeout has no problem with some people’s decision not to eat animal products, we occasionally find ourselves rolling our eyes at extreme vegan outrage. 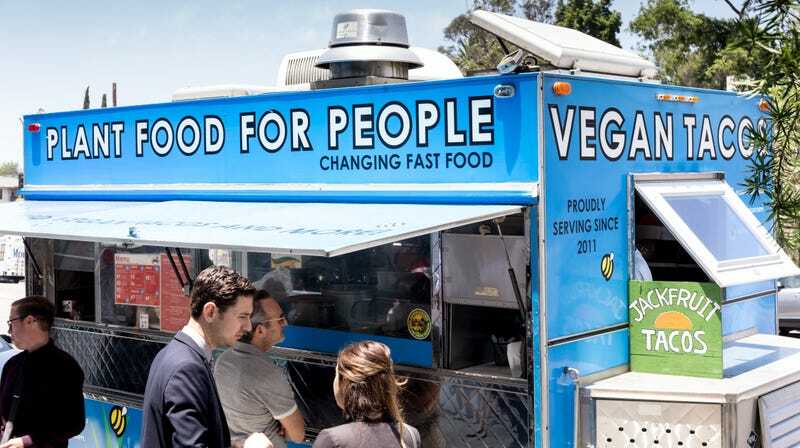 Today, however, we are on the side of pissed-off vegans, who are up in arms after a food truck at Houston’s Vegandale festival served meat and other animal products. The Houston Chronicle reports the truck from Mi Patio Cafe & Grill has apologized for serving those foods at the event, which was billed as “100-percent vegan… Where you don’t have to worry about ingredients.” The restaurant’s owner chalked it up to a miscommunication, saying organizers didn’t provide her information about what items could and couldn’t be sold at the festival. Yeah, a little guidance would probably have helped, but in 2018, is “vegan” not self-explanatory? “The people who make this festival invited us and they knew we were not vegan. They never told me I could not sell any meat. It was probably miscommunication,” Barrera told the Chronicle. Mi Patio faced swift backlash, with many of the complaints summarized by “lactation blogger” Mama’s Milk, No Chaser. The blog posted photos of Mi Patio’s menus, which were supposedly color-coded to indicate vegan vs. non-vegan offerings, but which festival attendees suspect were cooked in a meat broth and may have contained non-vegan products like mayonnaise. The blog post also includes screengrabs of lengthy back-and-forth conversations between a vegan festival attendee and the restaurant, which seem to indicate a lot of confusion. Mi Patio admits the restaurant “didn’t plan correctly.” Facing a torrent of criticism, Mi Patio has taken down its Facebook page. Here’s our read: Yeah, vegan festival attendees are right to be pissed off. Even if meat products were clearly labelled—and it doesn’t sound like they were—they have no place at a “100-percent vegan festival” where guests were told they wouldn’t have to pore over menus and inquire about ingredients. But festival organizers could probably do a better job in the future of vetting restaurants and making sure all vendors understand exactly what vegans can and can’t consume. Here, we’ll get you started.